Lately it seems that I have needed encouragement cards, sympathy cards, and praying for you cards. This card could be used for any of these. 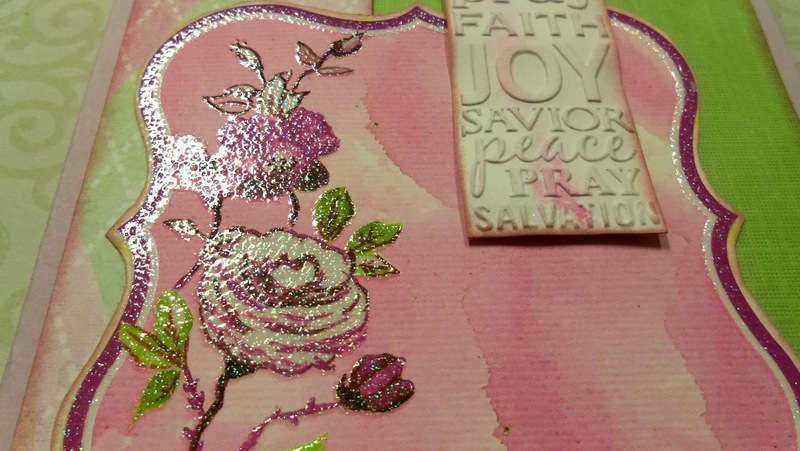 I really love this Darice - Faith Words in Cross embossing folder. It can be used for Easter or for any of the above occasions. I dabbed the inside of the folder with Distress Inks in Victorian Velvet and Peeled Paint and misted lightly before embossing the white cardstock. Love the watercolor effect!! 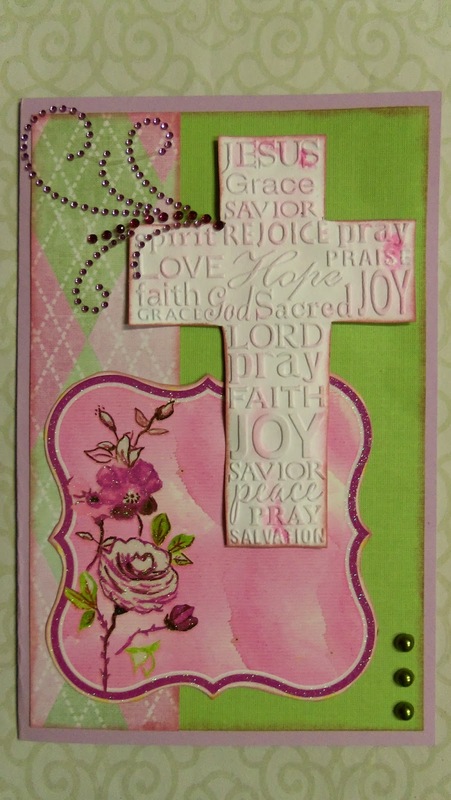 I used some pieces from my scrap bag for the background and a fancy border journaling card from a DCWV stack. You can see the gleam and glitter below. It has a watercolor look to it, too, that coordinates with my embossed piece. I finished it off with a sparkling Zva crystal swirl and some adhesive pearls. Hope you liked this card. Thank you for your lovely comments!!! This is really lovely Janis. I hope you have enjoyed your summer?? It is nearly over and I am looking forward to getting some play time in my craftroom. Your card is gorgeous! I love the pink and green color combination! The cross looks amazing and it does look like you watercolored it. Thanks for sharing with us at DL.ART Challenges! What a lovely card. First, I really like how you used the embossing folder. I am going to have to try the misting technique on mine. Second, that journaling card was a perfect pairing. Great take on the challenge!! What a sweet card! Love the fresh colors!! 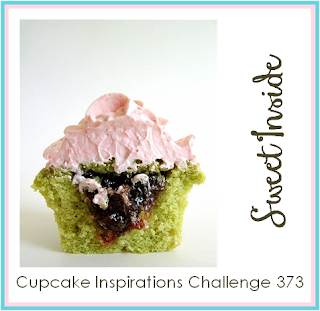 So glad you joined this week's Cupcake Inspirations Challenge! Wow Janis, this is gorgeous! That embossing folder is already so pretty but the inking gives it just the perfect amount of dimension and color. The green tones are a wonderful counterpoint to the pink and flowers...such a sweet fresh look. Gorgeous! The shimmer, the embossing, the sentiment...a marvelous combination of techniques and elements! Thank you for sharing your creativity at Cupcake Inspirations! Beautiful card. Thank you for joining our Great Impressions Challenge this month, and I hope you to see you next month. This is gorgeous! Love the dry embossing. Thanks for joining us at Great Impressions! Very pretty card. 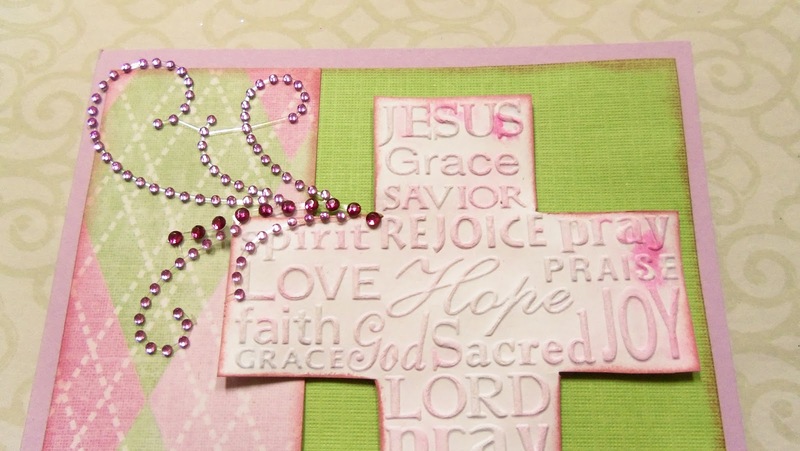 I love the way you embossed the cross-the colors are gorgeous. Thank you for joining the DL.ART Thankful Thursday Anything Goes September Linky Challenge. Whole Bunch of Wild Animal Masculine Cards! !